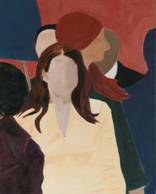 Michelle Templeton’s work focuses around human gesture and shape derived from significant personal moments of her life. Templeton doubles as an editor for a University Psychology publication, and her fastidious observation of human behavior is essential to the scope of her work. She also brings these skills of perception to the canvas using paint and brush. Janet Marcavage’s work addresses the properties of the body and current issues in genetics through printmaking, papermaking and installation. 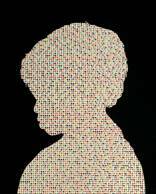 Using colored dots and embossing techniques similar to the visual display of molecular DNA coding, Marcavage expresses a correlation between the changes in science and how we see ourselves. Marcavage is also the assistant professor of Printmaking at the University of Puget Sound. 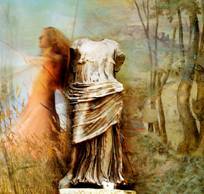 Fine Art Photographer, Nancy Angermeyer, draws from classical Greek form and surrealism for her inspiration. Angermeyer’s movement-based photographs are ethereal and sometimes eerie, but always beautiful representations of the human figure. Angermeyer is a native of Wisconsin and holds an MFA in painting from the University of Kentucky. Currently, she lives and works as an artist in Vancouver, BC.